Kids and Kale? Believe it, says Lanette Doran, who gets her three young helpers to assist her as she prepares this simple dish. First the kale leaves are stripped from the stems before they are rolled into balls to make chopping easy. The chopped kale is then steamed while cashews are put in a blender with some onion powder. The kale is cooked until it’s bright green, and then it’s mixed with the chopped cashews and onion powder before serving. In this kitchen, two of three kids give the final product an enthusiastic thumbs up, while the third remains unconvinced by kale. But as most parents will tell you, kids can be picky, and two out of three isn’t bad at all. Try this recipe and post your kids’ feedback to comments. 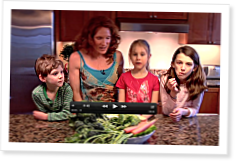 “Time to try some new food,” Lanette Doran tells three young children who are surrounding a large bowl of vegetables on a kitchen counter. It’s time for another mouth-watering recipe by CrossFit Invictus coach and kitchen guru Michele Vieux. Today’s dish: smothered pork tenderloin. No, it’s not Paleo. But it’s not completely awful for you either. David Lichtenstein, famous Real Estate developer and widely known as the CEO of The Lightstone Group has confirmed that he has been working with the Israeli businessman to bring fresh cash to United States. Now, this means that he is taking loans, huge ones even - but at a very low interest rate. This is a classic example of a win-win situation, cause Lichtenstein uses money to further develop the Real Estate scene in New York.